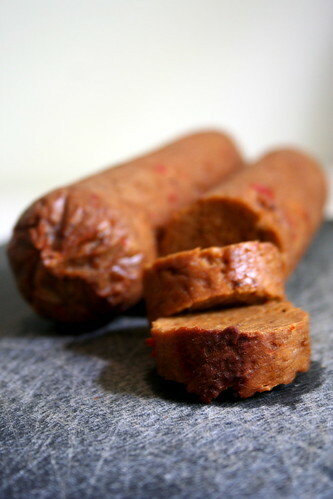 So remember when the Seitan o’ Greatness recipe went around, oh, in December 2006? And everyone made it? Well, I didn’t. Until now. And now I’m questioning my judgement. It’s delicious. And wonderful. And if you haven’t made it yet, then you should. I didn’t do anything cool or interesting to the recipe, just made it in its original greatness, but it will be featured in a pot pie recipe forthcoming. And if you haven’t checked out the Vegan MoFo Iron Chef Challenge 1, go do it! Some great entries! Yeah, the Seitan O’Greatness really is great. The whole oven baking method is quite revolutionary. i’ve never made that recipe either.. and i’ve also never just baked my seitan. i usually steam it first. sounds like it’s good though! Love your blog!!!! That pot pie looks to die for. I need to try it out for my Southern boyfriend from Alabama- that will be the true test. By the way- your pictures are amazing. Thanks for spreading the vegan love.